State enforcement officers have seized a barge and floating dock in Kaneohe Bay suspected of being used in illegal commercial fishing activities. A Circuit Court judge granted the state's petition for forfeiture, and a default judgment was entered yesterday. Undercover officers bought undersize Samoan crabs on three occasions from people on the barge, according to a news release yesterday from the Department of Land and Natural Resources. DLNR Conservation and Resources Enforcement officers and Honolulu police conducted a nine-month investigation that yielded 13 criminal charges of resources violations. They included four counts of sale and possession of undersize Samoan crabs. One person was arrested on outstanding warrants, according to the state. Officers executed a search warrant in October and found evidence of the illegal commercial fishing operation, drugs and drug paraphernalia, and packaging for crystal methamphetamine distribution, the state release said. The seized barge will be towed to Heeia-Kea Harbor for demolition. The city will get $200,000 in federal grants to conduct assessments for sites contaminated by petroleum or other hazardous substances. The money will be used to find potential sites for future cleanup and redevelopment as part of the U.S. Environmental Protection Agency's "Brownfields" program. The project is aimed at converting some 450,000 contaminated sites nationwide into public spaces, including parks, golf courses, trails and housing. Already the program has doled out 883 assessment grants, 238 cleanup grants and 202 loans. For more information, go to www.epa.gov/brownfields. State officials will be accepting applications for state ID cards from 8:30 a.m. to 2 p.m. today at Kapolei High School, 91-5007 Kapolei Parkway. The fee is $15, or $10 for those 65 and older, cash only. Priority will be given to those who have completed application forms and certified documents. New applicants need to bring an original Social Security card, a Social Security health insurance card with an "A" designation after the Social Security number, or a valid or expired Hawaii driver's license bearing a Social Security number. Those applying for an ID card for the first time also need to bring a certified copy of their birth certificate or a resident alien card, if applicable. No documents are needed for applicants who are renewing a current identification card who have not had any changes to their name or citizenship. Anyone who has changed name due to marriage, divorce, adoption or citizenship is required to bring in certified original documents. For more information, call 587-3112 or go to www.stateid. hawaii.gov. Application forms can be downloaded from the Web site or picked up at their office. Identification cards will be mailed to an applicant within five to 10 working days. » June 24 at Filipino Community Center, 94-428 Mokuola St.
» Sept. 23 at Mililani High School, 95-1200 Meheula Parkway. » Neil Scott, director of the Archimedes Project, Curriculum Research & Development Group, at the University of Hawaii-Manoa, has been given an honorary doctorate from the University of Canterbury in New Zealand. He was recognized for his work in technological developments in adapting computers for disabled people. » The University of Hawaii William S. Richardson School of Law has awarded its 2006-2007 Freeman Foundation Fellowships to Sun Samnang of Cambodia and Wang Zhiyong of China to complete a year of their Master of Laws program. » Peter Jhun and Ruby Silva were named the Outstanding Male and Female Volunteers respectively of the 40th Annual Mayor's Senior Recognition Program. Akamai Living Awards, also recognizing exemplary volunteer service, went to Doris Ikenaga, Venus Holt, Dorothy Chock, Yolanda Padua, Narzal Concepcion and Kikue Kaye Higuchi. Juhn, 79, founded the Therapeutic Recreation program at Kalakaua Gym for stroke victims after nursing himself back to health following a stroke in 1985. The former boxing coach and referee has adapted exercise equipment to help 180 seniors regain their strength. He also has invited children from low-income families to learn boxing and self-discipline through training. Silva, 74, was a full-time caregiver for 54 years for her paraplegic daughter, and 10 years for her husband, who suffered a stroke. Both died in 2005. She also took care of a 79-year-old mentally disabled man. The AARP Hawaii chapter, where she holds three volunteer positions, nominated her for the award. » The first Mental Health Awards has recognized Joanne Lundstrom, executive director of Mental Health Kokua, as Outstanding Executive; Geary G. Krueger, a consumer advocate, Outstanding Individual; and Helping Hands Hawaii, Outstanding Agency. » The Honolulu Fire Department promoted the following men to fire captain on April 19: Robert P. Abbley, Raul G. Fallau, Gregory J. Ikeda, Kim R. Rogge, Michael Y. Kaneshiro, Wayne K. Masuda, Mark K. Nakagawa, Thomas Simon, Scot L. Suiso and Ryan S. Kaleo. » Marilyn Cristofori has been promoted to chief executive officer of Hawaii Arts Alliance, a nonprofit organization that cultivates and sustains the arts in education and the community. She joined the alliance in 1994 and became its executive director. Cristofori currently serves on the National Leadership Committee for the Kennedy Center Alliance for Arts Education Network and as administrative director for Dance Pioneers. » Ten high school students have been awarded college scholarships up to $4,000 by Hawaii Self Storage. Each student will receive $1,000 for two years for associate degrees and four years for bachelor's degrees. The winners are Shelby Williams, Aiea High School; Long Nguyen and Bao-Yen Nguyen, Farrington High School; Quynh Hoa Tran, Kaimuki High School; Pamela Mizuno, Kapolei High School; Christy Tatsuyama, Mililani High School; Victoria Chen, Moanalua High School; Jessica Fabrigas, Pearl City High School; Marie Fe Bumanglag, Radford High School; and Rachelle Raposas, Waipahu High School. 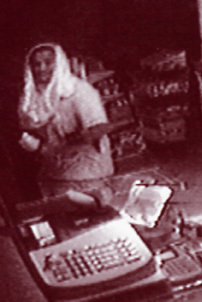 Police are looking for two men who robbed the Good-rich Liquor Store in Moiliili on Wednesday night. Police are looking for two men in their 20s who allegedly robbed a Moiliili liquor store on Wednesday. Police said two men entered Goodrich Liquor Store, 2828 S. King St., at about 8:55 p.m. Wednesday. One man had a handgun. They demanded money and fled on foot in an unknown direction, police said. Both men are described as 5 feet 8 inches tall and weighing about 220 pounds. The armed man wore a striped polo shirt and a bandanna on his head and face. The other wore a white T-shirt and had a white T-shirt wrapped around his face. Anyone with information about the suspects or this crime is asked to call CrimeStoppers at 955-8300 or *CRIME on a cell phone.